Rope Making with Sound UAL Thinkers. https://vimeo.com/133047873 'Crap-tech ' was a name given (usually by non-believers) to some of my early textile engineering projects. Crap they might look, and low tech they always are, but here is proof that high tech has to start with the low. 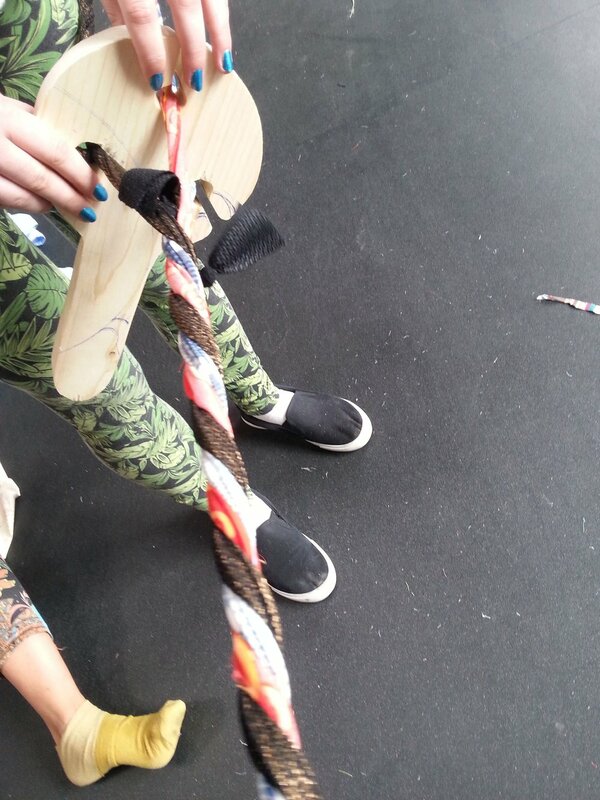 On Monday, I jointed the UAL 'High Tech Low Tech Community', to help investigate how sound could travel through rope. Here is a draft film featuring the Rope Making Machine Mark 1, cobbled together with one end of an old 3 ply rope making mechanism bought in Huddersfield, an industrial trolly, a wheel made from a revolving cake stand, some ply wood and two cupboard handles, and two ply controlling tools cut out of scraps of pine. The group consists of Anne Marr Course Leader BA Textile design CSM, Tom Gardner, Senior Lecturer in Communication at LCC, Kevin Walker, Head of Program in Information Experience Design RCA, Colin Priest, Course Leader, BA Interiors and Spatial Design, and Nicholas Marechel physical Computing specialist from LCC. These UAL tutors really love their investigation work. Here they are recording everything. I now refuse to accept Crap - Tech as an applicable adjective. The most simple tools can enable big thinkers to come up with beautiful ideas. The discussions after we made rope, gushed. 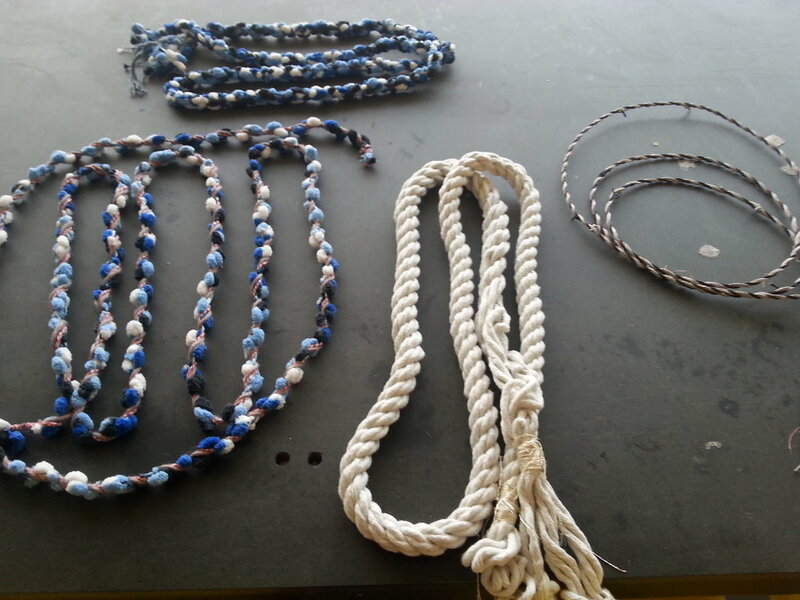 Rope Making becomes really interesting when you mix the materials. The thin rope on the right was made with paper and copper wire, which came in thin strips, which we then knotted together. The Paper yarn, which was twisted before we started, remained strong through out the process. The Copper however became very loose with the first twists, and then as the plying together happened, it became very tight, to the point of us wondering whether it might snap. It didn't snap. Usually when you free the newly made rope from the machine, it behaves as we all do when let loose from a tight situation - it bounces, dances a bit, likes to untangle itself and feel a bit free. A Rope needs to be giggled about a bit before it finds it's true nature. The wire and paper rope didn't do this - it just stayed the same, happy to do as it was told. The Group gave this rope the working title of BT/Infinity/Virgin. Colin bought some pom pom yarn from the pound store, which made some interesting effects when mixed with flatter yarns. Here it is twisted with jute and cotton. Working title name 'Referendum'. I really liked Tom's idea that the Rope Making Machine has 3 ply, and in music the basic Chords, have 3 notes. That got me thinking about 3's and I was led to a Wikipedia page about Philosophical Trichotomies! Yes! Everything fits into 3's for philosophers through the ages. Including my favourite philosophers, the low tech Punks. Here are the 3 chords you need to start a band, as seen in 'Sniffin' Glue ' magazine 1976. The High Tech Low Tech community have asked me back to work on a sound piece with them in September. Watch this space for the next installment. 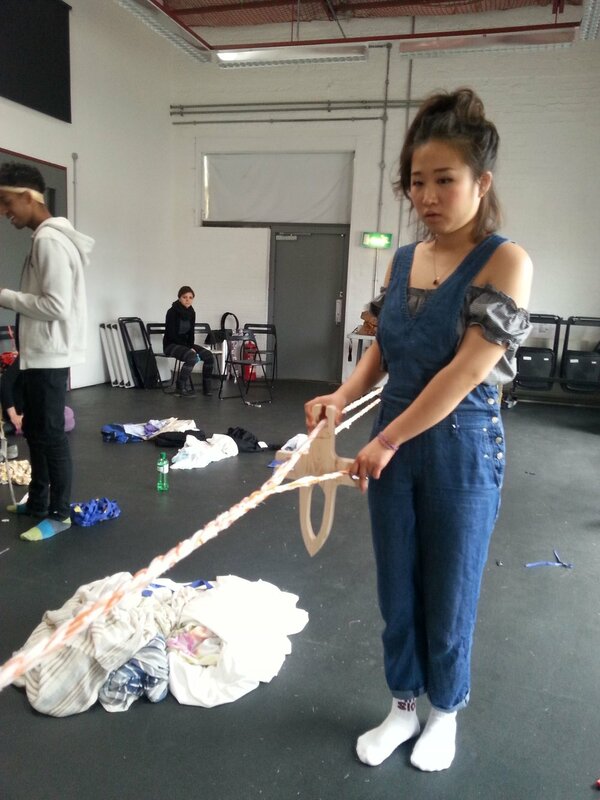 Yesterday was a difficult but productive day with CSM Textile students. Our brief was to work in the Olympic Park, and make an interactive textile situation. The Olympic Park, if you haven't been there, is exposed and quite strange. There is great planting, but it is not matured enough to make us feel that we are in nature, and the atmosphere is not relaxed as there are major Building works still taking place. These are all great reasons to make something happen! We gathered with bags of old fabric, and my newly made Rope Making Machine, which I had not yet tested. We were rained indoors for the Morning. Our plan was to make thick rope and then take it back to the park to see how we could use it. The students first learned the trick of cutting fabric into one continuous thread from something 'bag like' such as a pillow case, douvet cover or t-shirt. When the thread was made, we threaded it onto the rope making machine. This end of the rope making machine is made from 3 pieces of ply wood and a lazy kate mechanism, you know, the thing that makes a revolving plate of cakes move around. In the middle was a big hook. 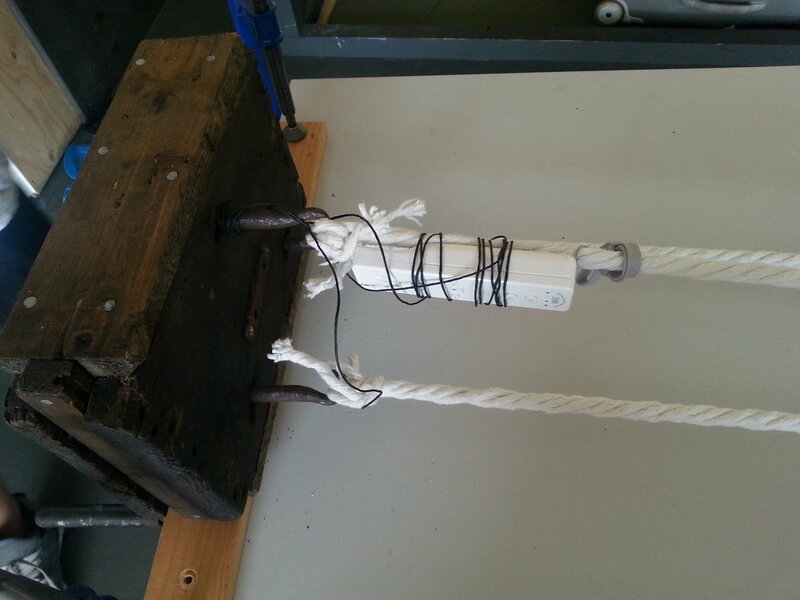 The wooden contraption was tied onto the trolly because the ends of the rope making machine have to be free to move as the rope tension gets tighter. The trolly is worked well because you can stand on it, using your own weight to add tension. You can also use it for carting all the equipment around. The main part of the rope making machine has 3 hooks on cogs, which twist the tread when you crank the handle. You do this clockwise. The mechanism was clamped to the Bench 'n' Vice. This wasn't ideal but until I have built it a base it works very well! The Bench 'n' Vice is also good for adding tension as you can climb on the bench to give the machine more staying power. When the machine gets going the two ends are under so much tension from the rope, that they get pulled towards each other. The students walked the walk with their thread, 6 times for each hook, making 18 ply in total. I wound the main handle clockwise to give each of the 3 plys it's twist. The handle was quite stiff and made an industrial crunchy revolving sound. Everyone stopped talking. When the plys where spun, the student at the trolly end, started to wind anti clockwise. The student in the middle controlled the twist, as it worked it's way back up the rope walk. The twist was controlled with another tool I made, cut out of wood. Once all our ropes were made, the sun came out and it was time to go back into the park to apply our rope to park type behavior, or design. First we tried Cats Cradle on a large scale, and then we found a lovely space to try skipping. Two of us held the ends of the rope , while skippers started jumping and trying to remember old skipping songs. The skipping was thoroughly enjoyed for about 1 minute 30 seconds when suddenly security turned up to tell us that we did not have permission to skip. You can not skip in the Olympic Park without permission. The Olympic Park invites artists to come and make things in the park, but that does not mean you can assume that you can skip without asking. Neither can you fly kites. We had wanted to ask security if they fancied a Tug of War, but thought it best to wait until another day. So we set about finding other uses for our rope. One was to protect the plants, which will look lovely later in the summer. There seem to be a lot of variety there. The next idea was to offer our rope as a more decorative version of the rope that the cranes were using. We were sure the builders would find our rope a lot more beautiful, and we were sure it could hold a lot of weight, but we felt we had caused enough trouble for one day. Every once in a while, I get a call from Mother Seraphima and the Sisters, possibly the most creative knitting nuns in the United States of America. I first met Mother Seraphima and the Sisters when they came on a flying visit to Prick Your Finger after visiting the grave of their former Mother Superior in Kent. Their Mother Superior had knitted in UK sheep breeds and these sisters wanted to continue the tradition. 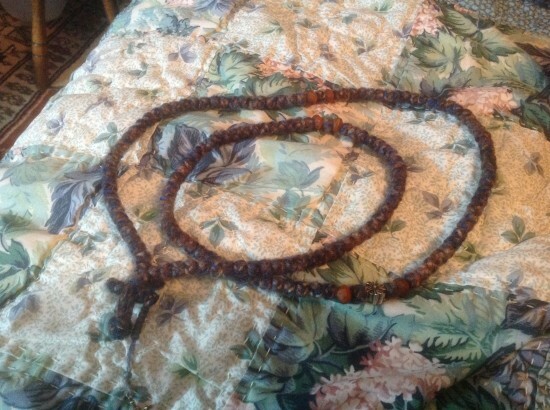 This week Mother sent me this picture of the prayer rope she had made by knotting Cecilia and Jean’s Wild Wool Wool. 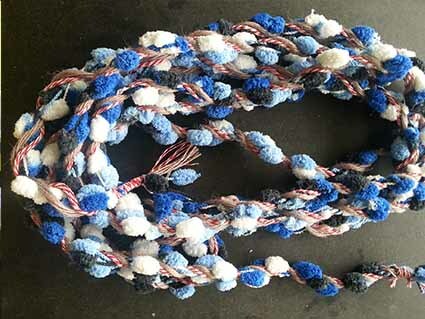 Mother sent us a link of how to make a prayer rope on U tube here. All the Sisters have been having a go. http://www.youtube.com/watch?v=3lTwPCgwj4c She will soon be sending us a leaflet on how to make them, and we will have a go. I think they make a lovely piece of something to help us which ever way we pray. Cecilia and Jean of Wild Wood Wool are most flattered. 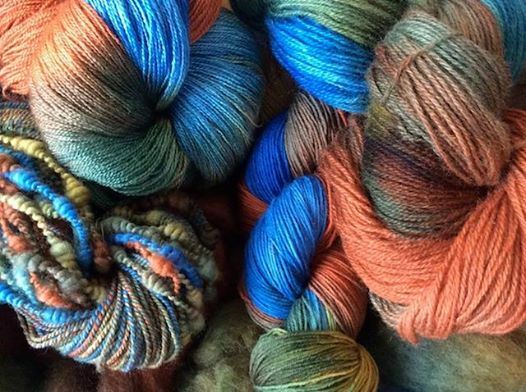 Here is some wool they dyed inspired by a beach hedge and blue sky. 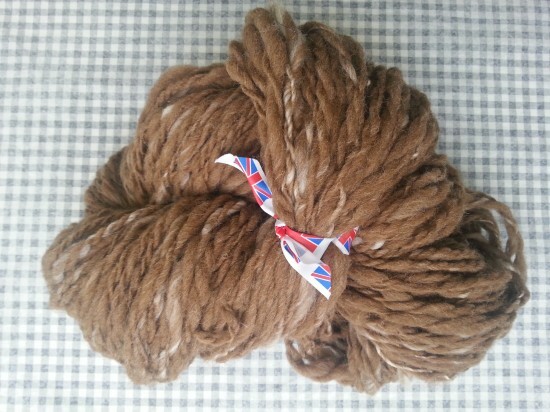 A few months back I spun Mother Seraphima this chunky Manx yarn. 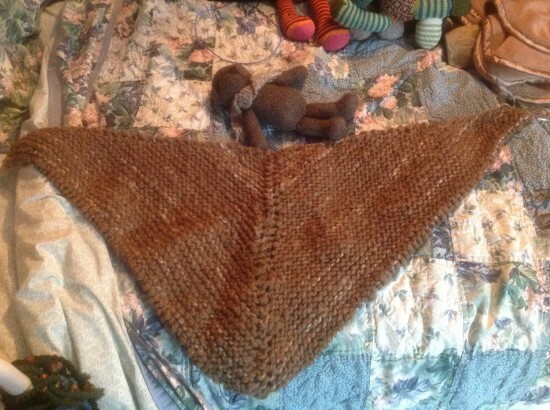 She is knitting it up into a shawl. So far it is big enough for her bear to wear, but when the American heat wave cools down and she has finished her busy schedule of charity works, she will make it big enough to keep her cosy through the winter. Love to Mother and the Sisters. KNOT NIGHT- A CONFISCATION OF STRING. Celia I had the most enjoyable evening at the Whitechapel Gallery recently, with Richard Wentworth and his portholes into the world of string. Wentworth was the inaugural curator of the Study Studio's Cabinet of curiosities, which he filled with his personal string collection, a ball of which is pictured above. 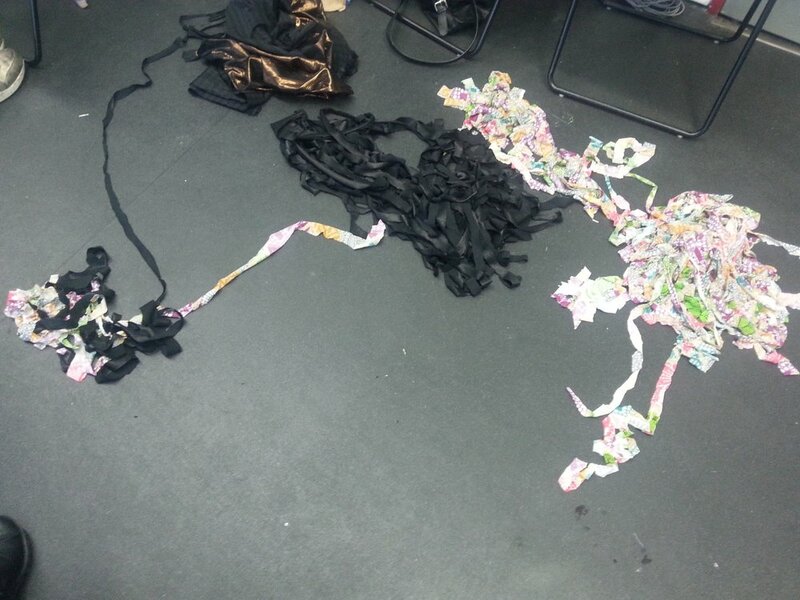 These are the pieces of string he 'confiscated' from us. He has asked us to add more bits of string. We learned that the root of the word 'string' is the same as 'strong', 'stringent', 'strict', and 'strangle'. String contains no glue, the material is held together with friction between the fibres. If the friction is too tight it could snap, and if it is too loose it goes elastic. String is one dimensional. That gives it a lot of powers, it could go in a direct line, or if it keeps piling up it could fill a whole space! So when does string become rope? Mark Miodownik, the materials expert, decided it becomes rope when you tie a horse up with it. Extreme sport ropes are made differently to traditional rope. Traditional rope is spun from individual plant fibres, and sport rope is woven from fibres that are one long continuous fibre. Modern sport ropes will not be made once the oil runs out, so get absailing now. If you bungee jumped with a traditional jute rope, it would have no elastic, so you might do yourself an injury. I took along our examples of making string, by spinning flax and a tribute to my string dishcloth. My string dishcloth photographed by Felicity Ford.